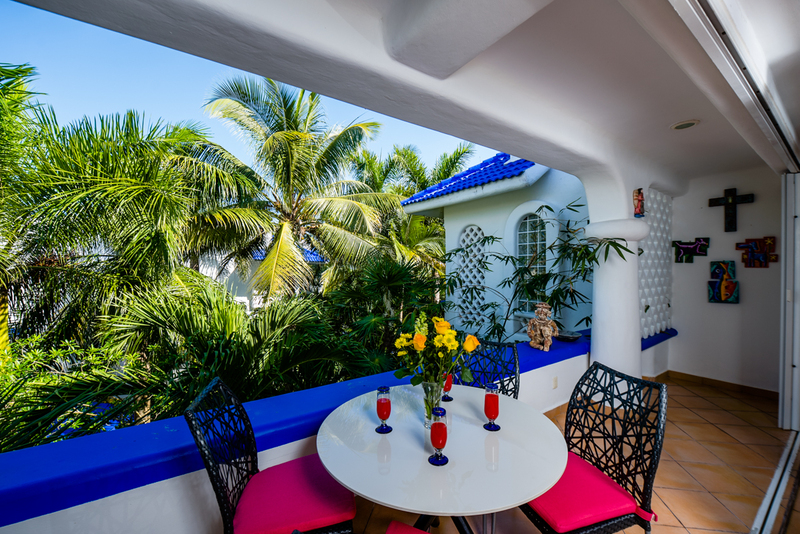 Steps from the beach, Casa Catalina is a 3 bedroom, 3 full bath condo with Internet well suited for a family or three couples looking to share the magic of a peaceful Mexican getaway. Located just a few steps from the beach Casa Catalina offers all modern necessities available: WIFI, Flat Screen TV with NETFLIX programming only, A/C, flat screen TV, fully furnished kitchen with all you can need to cook a gourmet meal, polished cement counter tops throughout, gas stove and oven, large refrigerator, flatware and dishes, dining table for 8. Spa quality bathroom amenities, bed linens, bath and beach towels. You will find original art work through out this vacation home created by one of the home’s owners, This home’s vibrant and simple elegant decor makes it stand apart from other properties in the area and complex. The covered terrace has seating and table for you to enjoy the sound of the many cascades running through. The living room is furnished with very comfortable furnishings. Only living area furnishes TV, DVD player and movies. Parking is available inside the Natz Ti Ha gates, within walking distance to famous 5 Ave. You will find many great restaurants, bars, shops and anything your heart desires for a wonderful relaxing vacation. The white sandy beach is 60 meters away, for your comfort beach chairs, cooler and a parasol shade is provided in condo. 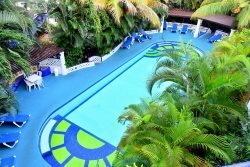 The Natz Ti Ha common pool is surrounded by lush gardens giving privacy to everyone who is enjoying the quiet seclusion of this tropical hideaway. WIFI - please bring your own laptop! Massage Service available for extra fee, 1 day notice is required.